The title of this post was taken from the song Let you Down by NF. "That Feeling When You're Not Necessarily Sad, But You Just Feel Really Empty." I have no idea who this quote is by but it perfectly describes how I'm feeling today. There have been some moments of intense anxiety today. 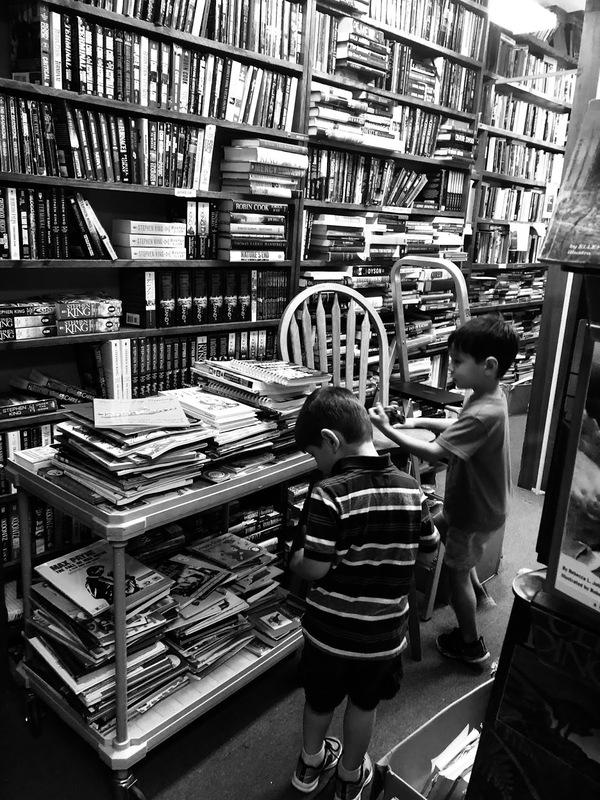 I took Mason, Jaxon, and Blake to a little bookstore in Lexington. 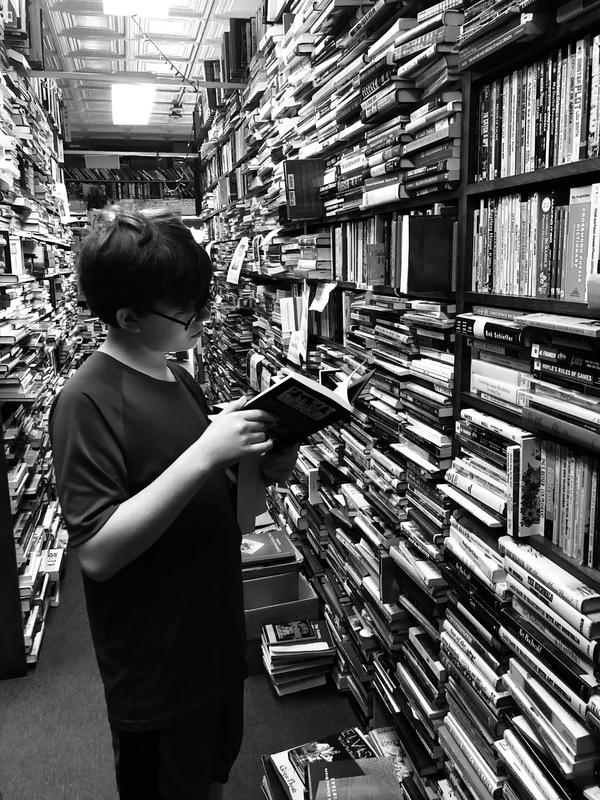 It's a quaint little place filled with books from floor to ceiling. The littles just wanted to run through the maze of books, but Mason methodically looked through them until he found several he wanted. Tomorrow is the 14th. I don't want to be home tomorrow. I want to get in my car and just drive until I feel better. I know I can't out run what I'm feeling, but I want to try. The title of this post was taken from the song Little Lion Man by Mumford and Sons. April 14, 2011. It's almost been eight years. Eight years since I walked up our stairs that last night and turned around as you told me you loved me. Eight years since I came home from work, a pit in my stomach because I already knew something was terribly wrong, and found you in our bed the way I left you that morning. Eight years since everything in my world forever changed. Eight years. The grief, the pain, the soul crushing weight is still here. I still have moments of absolute despair. There are nights that I cry myself to sleep. I've carved out a charming life for myself, but my heart breaks when you aren't here to share these hauntingly beautiful and mad moments. Our three beautiful angels are growing up and have changed so much over the last eight years. Our children have insanely exquisite personalities. I love them fiercely. You would be so proud of them. Even at their worst I know how lucky I am to call them mine. Sebastian will be 20 this year, Tyler will be 18 and Mason 13. How is that even possible?! They were 11, 9 and 4 when you died. I can't think about the all the years they lost with you because I'll go down the rabbit hole of emotions and tonight I don't want to take that journey. Life keeps moving on. Everyday I work hard to find the joy in this journey that has become my own. There are always small reminders of you though. I was looking at pictures of you from high school the other day and seeing your hands brought back a flood of memories. I can remember perfectly what your hand looked like as you held a pencil to draw. I distinctly remember the way you cracked your knuckles and played air drums on your steering wheel. It was an overwhelming moment of images and moments. My grief is never far below the surface. I miss you. What I wouldn't give to hear you tell me it was all okay and that you were proud of all that I've done and become. This week is always extremely difficult, watch over us. We love you dearly. You are always in our conversations and never far from our hearts. The title of this post was taken from the song Rise Up by Andra Day. As I'm sitting here typing this Sebastian is sleeping after slurping down dinner, he had his wisdom teeth removed last week. Mason is playing zombie cat with Blake. I don't even know where they come up with this stuff, but I love that my 11 year old is playing with the almost 3 year old. Jaxon is sick and sitting next to me watching cartoons. Tyler is at the store with John. I'm just taking it all in and reflecting on the year. 2017 - We've had our ups and downs. It's been a year of struggle mixed with moments of enlightenment. Things came to a turning point for me the day before Thanksgiving. We were all out of school for break and I had a pretty bad panic attack. I was at home with the kids and it kind of came out of nowhere. I don't like to talk about my anxiety. In our society there is such a stigma around the discussion of mental health and those that suffer from it. My anxiety is a part of who I am and I'm able to function with it, but the potential for having more peace in my life is great and that's what I'm working on. Anyway, I had been looking for a therapist for about a month and just hadn't gotten up the courage to call one. That day I did. Honestly, it was the day before Thanksgiving and I really didn't think anyone would answer the phone. Imagine my surprise when not only did someone answer but they had an appointment open for later that afternoon. I forced myself to go. It was the single best thing I've done for myself this year. I saw a therapist after Mike passed away, but I don't think we were a good fit and so I was skeptical about this one. The doctor I found is freaking amazing. I'm still dealing with my grief over losing Mike along with the generalized anxiety that developed after he passed. So, I'm seeing my therapist regularly as part of my self care routine. This alone has given me the courage to work on other parts of my life. I've started meditating each morning. A dear friend had been telling me about how it has helped her stay centered, but I didn't get it until recently. Now it's just a part of my daily routine. I'm ending this year on a very good note full of hope and plans for a wonderful new year. 2018 - I'm not making new years resolutions this year. Instead I'm focusing on habits I've already started and adding new ones as I feel I'm ready. My focus word for this coming year is Present. I want to live more in the present and not worry about the past or the future. Sebastian will graduate and go on to college this year and while I need to plan and make arrangements I want to enjoy it and live in the moment. I'll continue building on self care even when it's boring self care. I have long term goals for myself, but now I'm focusing on the steps that will get me there and not changing everything all at once. Tonight we ring in the new year without any fan fare. Just my small family doing what we do. I'm wishing all my friends and family the very best in the coming year. The title of this post was taken from the song You Found Me by The Fray. Things I've said to my kids this week. "Get the magnet out of your nose!" "Get your finger out of your nose!" "Why do you smell like spoiled milk?" "I'm your mother not your maid!" "No that grade is not okay. No, I don't care what your excuse is." "Stop wiping your snot on my shirt!" "You can't leave that blank. Colleges ask these questions for a reason, and no I'm not doing it for you." "When you get a job and make your own money you can buy those things." "I don't ever let you do anything or have any fun? I don't provide for you? Fine, if you don't need me and all the things you have you can go sleep naked in the road." "We don't kick our friends." "Don't use your shirt as a tissue." "If you don't put down that phone it will be mine!" "I don't have the money for that." "For the love! If one more child touches me, pulls on me, or attempts to wipe something on me I will lose it!" "We are not stopping for donuts you are pre-diabetic!" "We did not just have this for dinner I haven't made it in a month." "I can go to the bathroom by myself." "You do like this you eat it all the time!" "Use your napkin not your shirt!" "Don't drink your bath water!" "Don't stick your fingers in the dog's ears!" "Stop telling me you've pooped when you haven't!" "Stop dancing around and just go to the bathroom." "Get your hands out of your pants." "No, I don't know where you left your fundraiser." "I'll pay you $20 not to participate in the fundraiser." "No, you can't play with your magnets because you were spitting out your milk at lunch." "For the love! Get your hands out of your pants!" "Do you want me to talk to your coach? I cry when I get anxious too." "Come tell me about that A you got on your math test." "You were working hard at soccer tonight. I'm proud of you." "Let's read one story together and then make one up ourselves." "I do think your dad sees all the things you are doing." "Sometimes when I'm overwhelmed it helps me to make a list. Do you want me to help you make a list?" "Sweetie, what hurts? Your fever is 102." "Do you know how much I love you?" "You may be almost 18 but you will always be my baby." "You know you love my jokes." "I didn't wake you because I knew how tired you were." "I made your favorite dinner because I knew you had a rough day." "Let's pretend the floor is lava!" "I believe in you and everything you want to do with your life." "Never sell yourself short. I raised you better than that." "Tomorrow is a new day." "Good luck! I know how hard you've worked on learning your routine." "Okay, tell me about your game. I just don't understand it." "Call me if you need me...or just call me if you want to talk." "Always remember who you are."